This weekend saw me at Thought Bubble, a comic convention based in Leeds and in its sixth year. 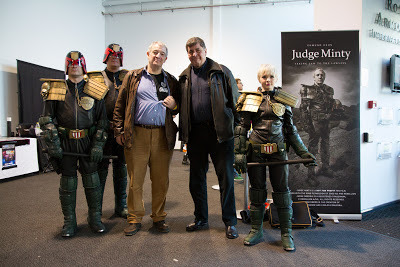 My reasons for being there were twofold - firstly, for trooping with the Galactic Knights and secondly to be part of an exclusive cast and crew screening of Judge Minty. My only previous experience of any footage was the teaser and some rough footage I'd been shown when I'd gone to Camberwell Studios back in August for some green-screen shooting, so I was genuinely thrilled to be seeing the finished film. My usual partner Senior Street Judge Burdis wouldn't be taking to the streets this weekend, but I got to troop with the more than capable Judge Stewart - I'd met Rob previously at both the Camberwell shoot and the Dredd 3D preview. It was an early start on Saturday morning to wander up and down intimidating and policing the crowd, but it was a good start to a fun (but long) day. I don't think I've had to pose for as many photographs since London Film and Comic Con. 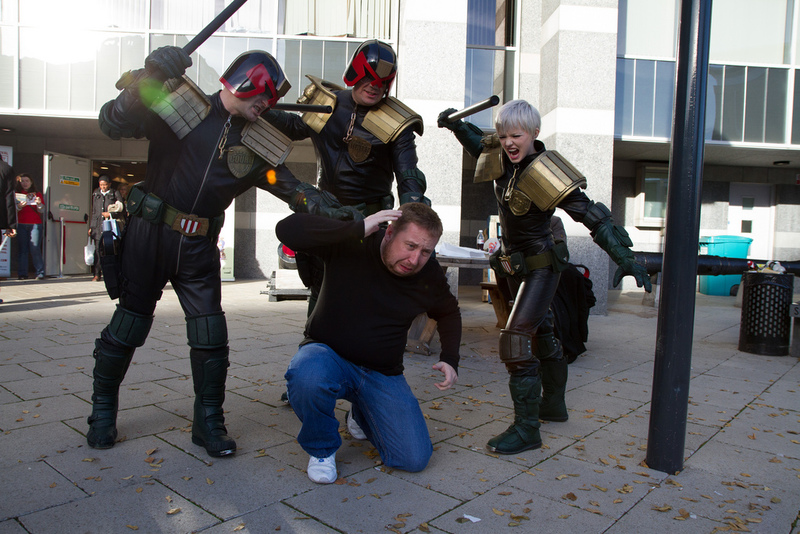 The Judge costume is an odd one in that either people don't mind when you grab them by the scruff of their neck and get a photograph of you beating them up, or they actually ask you to do so. And despite my small stature it's surprisingly easy to intimidate people in it - a useful tip I'd give to anybody trying to stare me down is never try and do so against a person with a tinted visor - you really don't know whether I'm blinking or not. On Sunday we were joined by Lauren, who fans will recognise as being the model playing Judge Anderson in the photographs on the Planet Replicas web site. Fun though it is judging - and the crowds at Thought Bubble were exceptionally good and receptive- it really is a case of the more the merrier, and we had a whale of a time posing for photographs with the public. But - the most important bit - the Judge Minty premiere on the Saturday night. Admittedly it was shown in Leeds as part of a double bill earlier in the week, but due to certain esteemed individuals in the audience, this was the big one. Some of the big names from 2000ad were there. Jock (who, as well as doing so for 2000ad, was also the concept artist on Dredd 3D), Henry Flint, Simon Davis and Al Ewing (whose current Dredd storyline in the comic - The Cold Deck - is the sole reason I've subscribed to 2000ad again after a long, long absence). And right at the front, on the same row as the charming Edmund Dehn - Judge Minty himself - was John Wagner - Dredds co-creator (along with artist Carlos Ezquerra). For the uninitiated - Judge Minty was a one-off story in issue 147 of 2000ad. 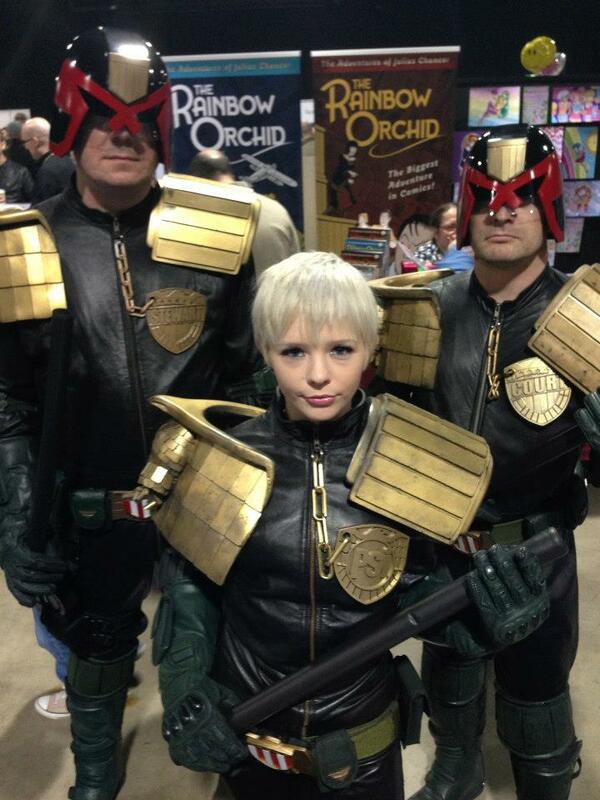 It told the tale of Judge Minty, a Senior Judge older than Dredd who - after a lapse in Judgement - decides to retire. Rather than settle for a career teaching cadets at the Academy of Law, he takes the other option - to take the Long Walk into the Cursed Earth, the irradiated hellhole outside the walls of Mega City One, to bring law unto the lawless. The Judge Minty movie takes that premise and elaborates upon it - after a quick scene-setting opening, the majority of the 25 minute running length takes place in the Cursed Earth - whereas the strip ended with Minty stepping out into it. I'm aware that this is probably the most biased review you'll read outside of a Sony Pictures release review by David Manning, but I loved every single minute of it. With its lean running time, the story moves along at a perfectly judged pace with never a dull moment. The trials and tribulations of Minty in the Cursed Earth felt very much like a natural progression to the strip I'd read all those years ago, and it felt very much like classic Dredd. And it looks absolutely remarkable, betraying its low budget - it very much felt like a huge budget production, and has to be commended for ambition alone - which has paid off in spades. The audience were in captivated silence throughout, and the end credits rolled. And then rapturous (and well deserved) applause which seemed to last for an absolute age. And then when it had died down John Wagner stood up and addressed the crowd, saying how much he'd enjoyed it. High praise indeed! Justice is finally administered to Pete Wells. I almost felt like a cheat sitting in that room with the cast and crew. I'm just a very lucky fan who - like many others - salivated over the teaser trailer released 2 years ago, and ended up being involved at the (for me) easy bit at the arse-end of a lengthy and gruelling shoot simply down to the fact I had a Judge Costume. But you know what? Even for my minor contribution, I'm incredibly proud to be a part of it. The (thoroughly charming) Edmund Dehn brings a true level of depth to Minty which is somewhat remarkable considering the short running time, and the two Steves (Director Steven Sterlacchini along with D.P. and Digital Image Director Stephen Green) should be incredibly proud of this gem they've created, as should Daniel for the props and costume design (who it was nice to finally meet) - as, it goes without saying, should everybody else involved with this. It's true testament to what can be achieved when genuine fans with a love for the source material get together, and it's also a far cry from the usual poorly acted Minecraft-level special effects stuff that usually passes for a fan film. If it's showing at local festivals, go and see it. If it's not showing at local movie festivals, nag them into showing it. Whether you're a fan of Dredd or not, Judge Minty is definitely something special. ...And if you do go and see it, keep a sharp eye out for an incredible handsome and rugged Judge (and his clone brother) manning the West Wall - starring in the only-to-be-released-in-my-head "Judge Court: Stalwart Hero of the West Wall"
I love comments. Love 'em. However, abusive or spam or Anonymous ones may well be sent straight to the bin. Thems the rules. The Poplar Tree was unavailable for comment. Jeremy Clarkson - "My work here is done". Digital Doll | a girl trying to learn the way of the computer, it's all geek to me! The Doctor Who Figures I Actually Want Them To Make.